Happy 4th of July, my American readers, which, I'm going to just assume is the majority of you (if there are international readers out there, I would love to hear from you!). This year is the first year I'll be celebrating the 4th of July without my family, which is a weird prospect for me. It's not that the 4th is a huge deal in my family, it's just that...we've always been together, doing almost the exact same thing, for basically my entire life (save the year we were in Canada for the 4th, but we still watched Canada Day fireworks together over Niagara Falls). Here's what always happened: when we were younger, we would go down to the park by the river, either together or with friends, and play silly carnival games, pet baby animals, and watch the water ski team do tricks. Then we either attended a party at a house on the river's edge, or, in more recent years, staked out a spot in the park and watched the fireworks over the river. I love fireworks – certain things will never stop being awe-inspiring to me, and the 4th has the added punch of nostalgia. Maybe I'll start developing new traditions? Or maybe things will just be eclectic and vary from year to year. 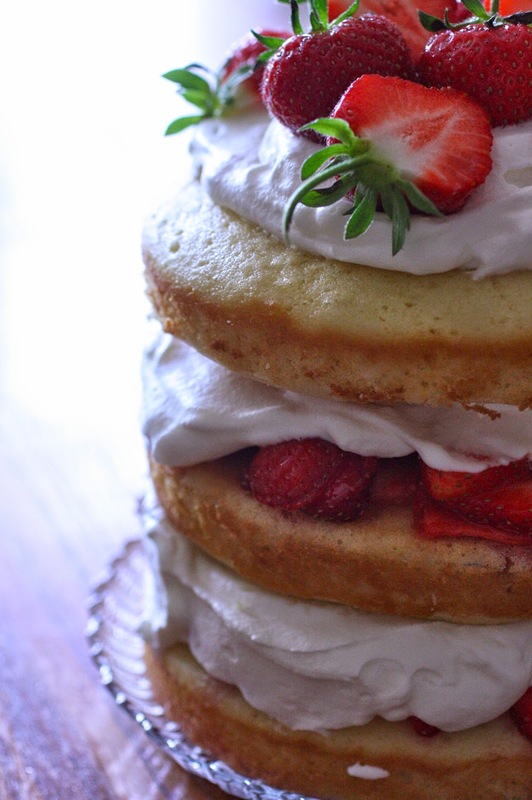 Maybe I'll make a massive strawberry shortcake like this one. It's not as big as it looks, since each layer is only 6 inches, but it's still fairly impressive. And way better than those spongy little cups and "non dairy whipped topping" (shiver). For the Cake Pre-heat the oven to 350 degrees F. Grease the bottoms and sides of three 6-inch round cake pans. Line the bottom with a round of parchment of waxed paper and then grease with butter. I make a strawberry cake for my mom ever year...I think I found this year's recipe.